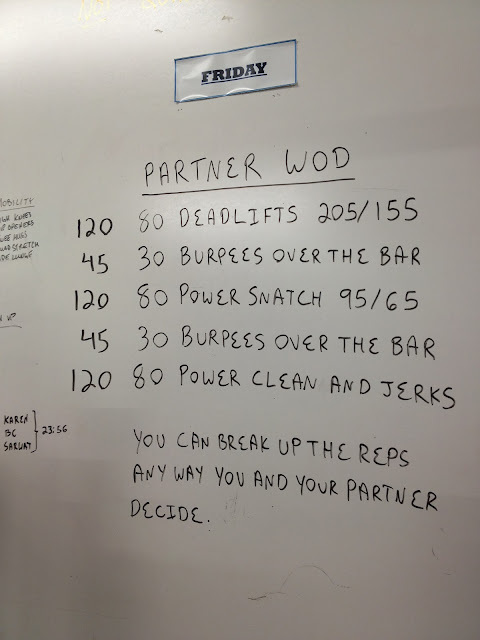 This meant that while 1-2 people did reps, the the third person rested and then switched off to complete the total number of reps. We shared the reps fairly! So I did 40 deadlifts, ~15 burpees, 40 power snatches and 40 power clean and jerks. I think we finished in 23:52. My shoulders and upper back were super sore the next day from all the snatches. I felt it while riding the singlespeed at Harris Lake. My legs also felt it and I was not feeling like I could do more than 1 lap at Harris! I figured since I was going to go ride San Lee the next day, I could take it easy at Harris. Little did I know that my San Lee ride would be cut short due to a mechanical! John managed to get a stick stuck in his derailleur and sheared of the hangar, leaving him without a working chain. We ended up cutting the ride around 5 miles. I got to do the Gauntlet and passed on doing the FreeFall since my left palm is still sore from the last beating I got there! Still the San Lee ride was good, I had a great pace and was working hard but it didn't feel painful. 78 lbs 1 rep! I tried two more times but my arms were not having it. Split squats holding a 35 lb kettlebell- tough! I'm excited to start up the mtb strength training again, I am hoping it will help continue to improve in the mountain biking arena!